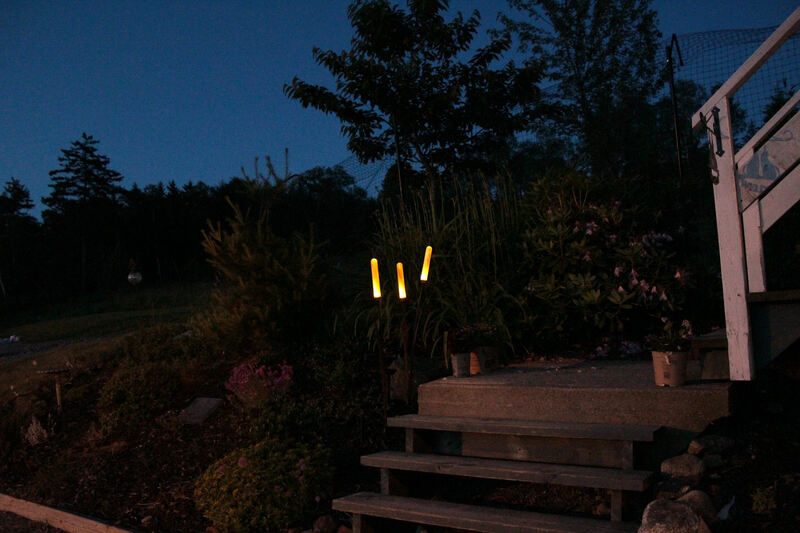 A few weeks ago at Costco I saw some solar lights made to look like cattails. I didn’t buy them at the time, but they stayed in my mind so last Thursday when we walked by them again, I picked them up. I set them up in the garden on Friday morning, so they would have the day to charge, and then watched with anticipation as evening came on. These photos are actually in reverse of the order they were taken in, but I think they flow better that way. They come as two pieces – one has two lights on it, the other is a single light. I actually moved them a bit closer together on Sunday, so they are in a slightly different position in this photo. This was taken from our living room, looking down through the window. I wasn’t sure how well the picture would come out, but I was pretty happy with it. 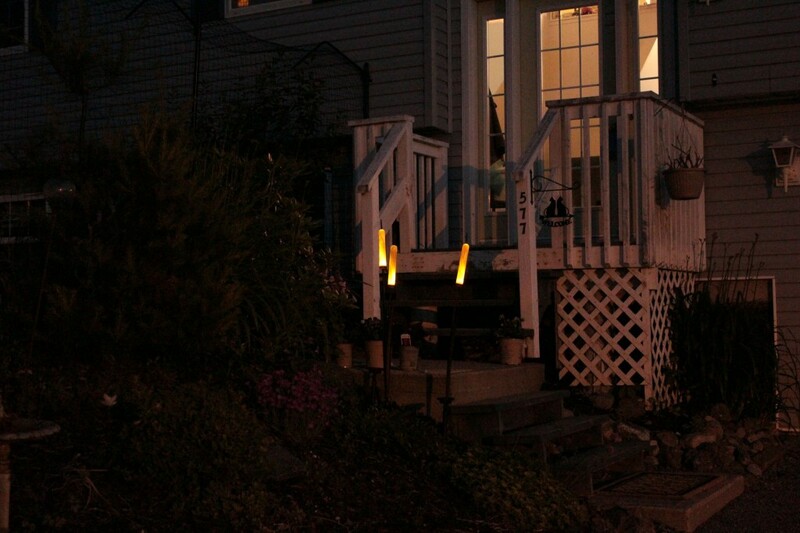 And these were taken from the driveway, using my tripod. It was actually quite dark, or so it seemed to me, so I was surprised how much light and colour came out on the photos. It’s worth clicking on these photos to see them enlarged. For this one, I was standing a little way out from our garage door. For this one, I was further down the driveway, looking toward the house. When I placed the lights by the front step, I wasn’t sure whether I wanted to leave them there permanently. Once I saw the lights in action, I decided I like it. I think it’s good having lights by the step that will come on automatically when it gets dark. This entry was posted in Garden 2011 and tagged Canon Rebel T3i. Bookmark the permalink. Those are pretty. Good idea to have them at the bottom of the stair. I have been trying to find these. Can you email me the manufacturer name? I emailed, but just in case – the box says Naturally Solar Garden Lights. Hope you find some. 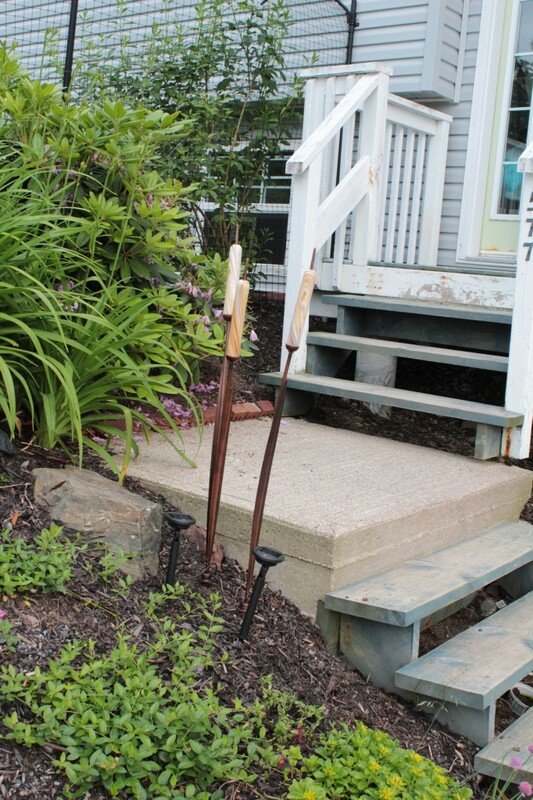 Could you send me the email address too for these beautiful cattails. I want to buy some for my garden. I don’t have an email address but the box lists the website http://globalxsupport.com/ plus the costco sites for canada, US, Europe and Australia. Good luck! Hey they are great – and so is the Purrfect Fence… we have one two (Purrfect Fence that is), and two cats, Robin and Scooter. I assume Frank and Zappa are the kitties. 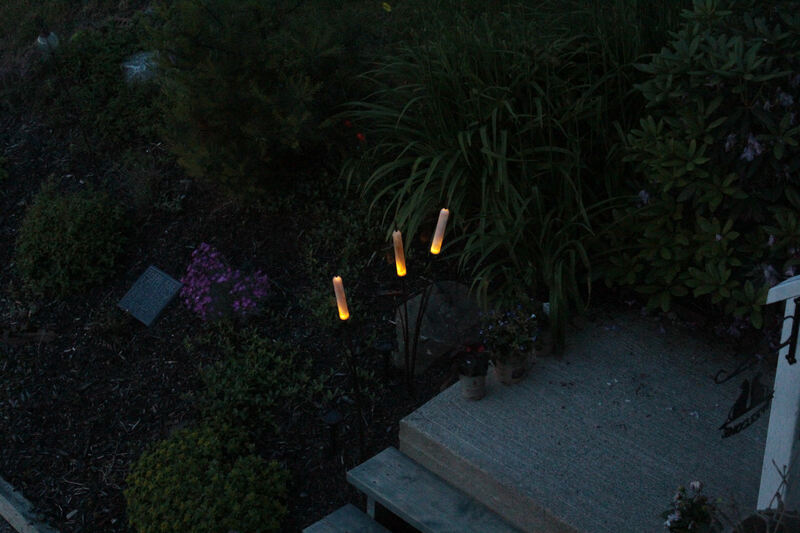 And wouldn’t you know it that we were at Costco last weekend and bought some of those Cattail lights and put them in the garden as well – they are sweet! I’m off to Costco at lunch today to get some more! We just picked them up at Costco today. Picked up mine at Costco yesterday. They are really gorgeous. The good thing is the price of $29.99 – if you google these lights you will find them $50.00 +. Highest price was $59.99. Great value at Costco. I can’t wait to see them lite up tonight. I received them for my birthday and liked them so much went to Costco and got another set .They do look nice beside my pond. Just wish I could get into their http://www.globalxsupport.com site just in-case I need replacement parts. They do have an address so it might be easier to write. I’m not sure why you are asking me, I’m just a consumer like yourself. I’d contact the person who gifted you the lights to find out where they got them and if they still have a receipt. Good luck! I love my cat tail lights! But one of the globes broke & I can’t get on their web site http://www.globalxsupport.com to order more globes. Where can I find a new bulb for my cattails. The link Carolyn posted above works for me and I they do have replacement globes listed. Good luck! I WOULD LIKE TO PURCHASE MORE CATAIL SOLOR LIKES CAN YOU HELP ME. Hi Judy. Try Costco or you can order from the website – http://globalxsupport.com/products1.html. I just saw them on line at Home Depot. Unfortunately, they sell only the 2 together; unlike Costco who sells 2 together plus one single one. Costco sells them for $29 for the 3 and Home Depot sells 2 for $58…rats. Constance…Oh, and Costco Reno had them last January and they sold out right away. On September 12, Costco in Bend Oregon had them. I’ve just ask for a friend to go see if they have more. Don’t know yet.